After fourteen consecutive events without a weather problem, the July edition of Cruisin’ Destination Daytona was cut short by rain. A good number of cruisers showed up under threatening skies, and the party was in full swing when the summer showers came and cut things short. The restaurants, food court, pubs, and shops were all open and there was plenty to eat and drink, as well as shops to browse. Many spectators and car owners used the rain as an excuse to stay and check out Houligan’s Spirited Sports Grille, the newest addition to Bruce Rossmeyer’s Destination Daytona complex. The theme for the July event was “Corvettes, and they showed up in mass. The Best Hardtop award went to went to Augie Smith out of Flagler Beach, FL for his 1991 model, while Geri and Anthony Petalaglia took the “Best Convertible” trophy home to Port Orange, FL. Elaine Laurent came over from Sarasota, FL in her 1966 Corvette Coupe and snagged the “Merchant’s Pick Award”. The trophies were sponsored by Diamond Back Classic Radial tires. Door prizes from Destination Daytona merchants, as well as Houligan’s Grille, YearOne, Doc’s Rod & Kustom, Total Performance Hot Rod Parts, and Diamond Back Classic Tires were given out early to beat the incoming weather. Admission and registration is always free, and a good time “Cruisin’ Style” is guaranteed – even in the rain. We attempted to shoot Ron O’Donnell’s beautiful Plymouth Road Runner with no one around it, but after waiting awhile we figured out that this orange beauty would always have someone checking it out. 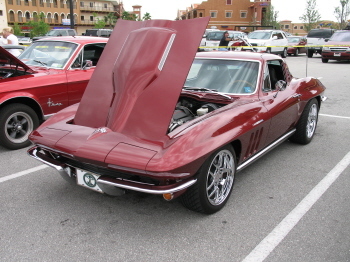 Peter Hartman is a local Ormond Beach resident and he brought out his beautiful Honduras maroon ’66 Vette for all to see. 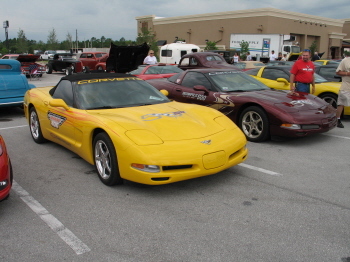 The late model, Z06, wheels add an nice touch, but we’ll bet the LT4 power plant is the real fun part of this fine ride. Cars are not the only attention getters at Destination Daytona. How about a late fifties Aristo Craft runabout? 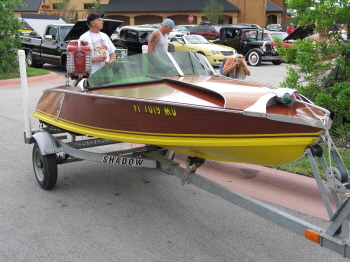 Manufactured by the Atlanta Boat Works, this baby is powered by a, period correct, Mercury Mark 30. 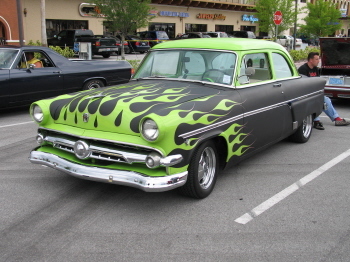 Lime Green flames over flat black got our attention. 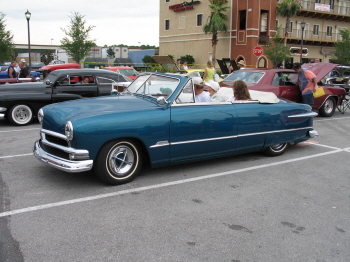 Darrell Angre drives this ’54 Ford sedan around the Ormond Beach, FL area. 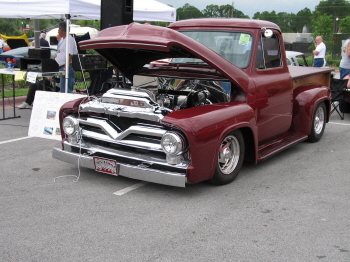 The DJ, Frank Roberts, hauls is equipment around in this early Ford “Big Window” pick up. 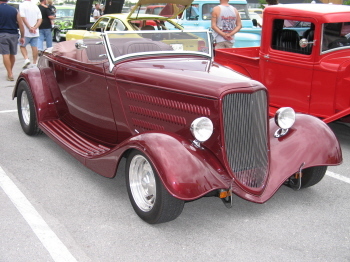 Pete and Deede Vanvourellis cruised up from Port Orange in their ’34 Ford Roadster. We bet the top was up when they left as the summer Florida showers rolled in and broke up the party. 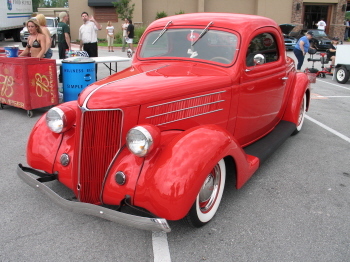 Bob Capestro recently finished this channeled ’32 Ford. 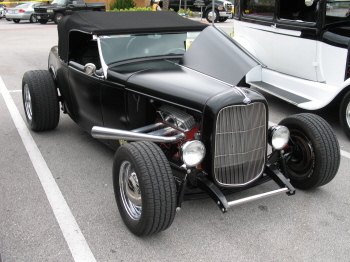 Three Stromberg’s on a small block, semi-gloss black, and red & white pin stripping highlight this ’50’s style hot rod. 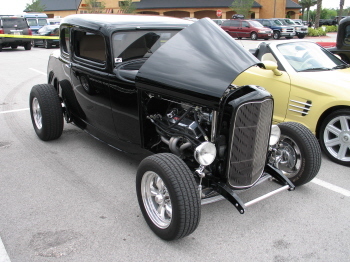 1932 Fords are probably the most popular hot rods out there, but you still don’t see an abundance of five-window coupes, especially five windows as nice as Monty Libert’s black highboy. Monty calls Deland, Fl home. 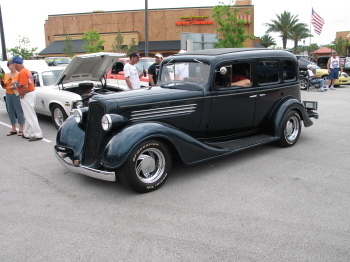 Teddy Dixon drove his recently acquired ’36 Ford Coupe up from New Smyrna Beach, FL. Bright “resale red” paint, wide whites, small hubcaps and trim rings, all add up to give this ride that sought after “traditional” look. 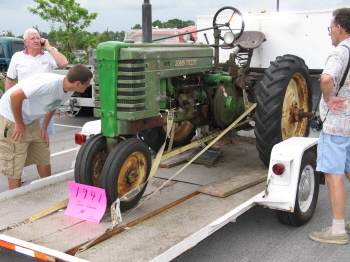 How about a 1941 John Deere Model H? This ride drew its share of attention. 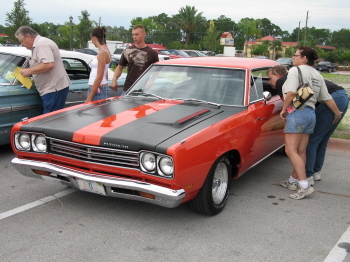 You just never know what type of vehicles you might find at Cruisin’ Destination Daytona. Apparently this mild custom 1950 Ford convertible is a family affair. It looks like father, mother, and kids are cruisin’.